This is my 2nd electric car. 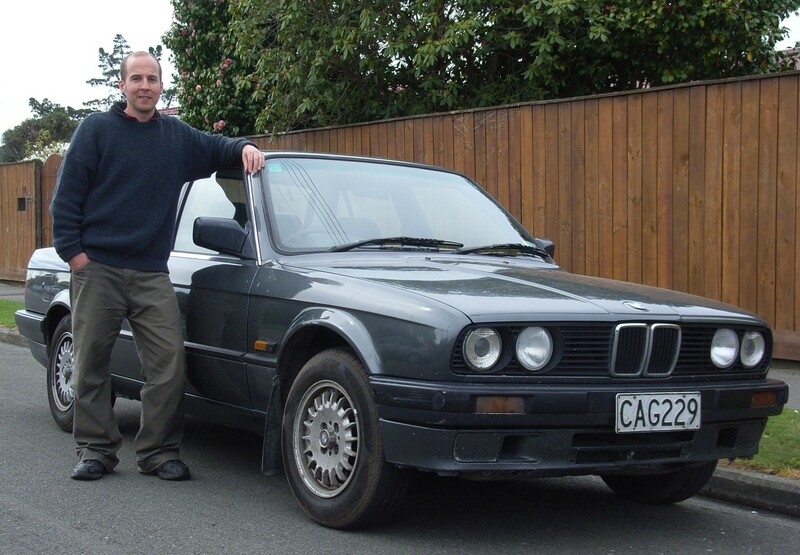 It's a home conversion, based on a 1988 BMW 318. She is silky smooth to drive and has a range of 100km with a top speed of 110km/hr. She runs two ADC L91's these are a series wound, brushed, DC motor. The motors are wired in series for maximum starting torque (in series they both receive the full 500A from the controller, voltage is ~72v.) They are mounted in the transmision tunnel, driving `nose to tail` onto the standard BMW driveshaft. Each is capable of ~50HP peak at 500A. The pack is 2/3rds under the bonnet and 1/3rd in the boot. She now weighs 1,240kg. This is a similar weight and the same front to rear weight balance as she had when she left the factory 28 years ago. Today (23rd May 2015) I hope to get some time to manually top balance a few low and high cells in my electric car's LiFePO4 battery pack. It's 6 months since I last did this. I find it impressive for a 6 year old pack that all 45 cells sit so close, but at this stage of their lives (about halfway through their life) some of the cells will start to drift away from their brothers. The worst part is that as a cell drifts higher, every discharge cycle it experiences a slightly lower C rate and thus discharges less deeply, therefore charging even higher every time the pack is charged. Conversely the weakest cell experiences a slightly higher C rating, and for the same journey discharges deeper than the other cells. Without a Battery Management System all the cells get the same amount of energy when the pack is charged, thus this lowest cell, stays the lowest cell. Each time discharging further than the others and each charge finishing at a slightly lower voltage. With a good BMS every cell's voltage is constantly measured, giving the driver a warning if a cell gets too low under discharge, preventing damage to that cell. The BMS also monitors all the cell voltages during charging, and will disconnect the charger if any cell goes too high. Using a BMS with top balancing, each charge cycle the cell voltages are gently leveled at the top, keeping all the cell voltages even when charged, thus stopping a dangerous runaway cell from overcharging, catching fire and ruining your car, perhaps your house and maybe even you ! Friends and I are developing our own open source BMS. We've decided on autonomous cell top modules that feed their voltage and temperature along a twisted wire pair to a master unit. This master unit will display highest and lowest cell voltages and which cell it is. It will warn if any cell goes below 2.5v and disconnect the charger if any cell goes above 3.6v. I will definately be top balancing and am really looking forward to having the extra protection that cell level telemetry provides. Click here for more information on our BMS and things we learned along the way as designed it.